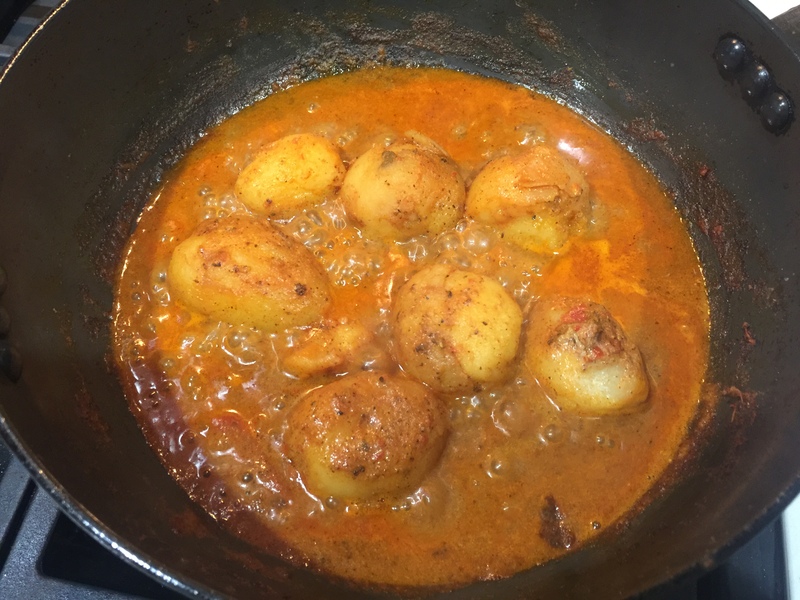 Another great recipe by Veg Recipes of India, these baby potatoes are super yummy and skip the onion giving them a totally different flavor. We had these with green beans w/ panch phoran which I will post soon. Boil baby potatoes until tender, then peel. Toast cumin seeds, fennel, cloves, cardamon and fenugreek until lightly brown. Coarsely grind in a spice or coffee grinder with the turmeric, chili powder, and coriander powder (I add the powdered spices at this point just to give more volume to the spices, it makes them grind better). Heat olive oil in a pan and add the ginger and green chilis, then add all the spices and pureed tomatoes. Cook until the tomato is no longer raw, then add the yogurt and cook down to a paste. Add the potatoes, water and salt and cook until the potatoes absorb the flavors.